Picking a retail winner isn't always so easy. Here are three tips that can help you see through the fog. Because investors tend to be familiar with many of these companies firsthand, retail can be a sector where the average investor might have an advantage over Wall Street -- you might have unique insight into a store you regularly visit that a professional investor wouldn't have. Famed mutual fund manager Peter Lynch advocated for buying such stocks, and was proud that many of his best ideas came from visits to the grocery store or chatting with friends about a product they liked. Similarly, two of Warren Buffett's favorite investment are Coca-Cola and Heinz, now part of Kraft Heinz, two products he is fond of not only as an investor but also as a consumer. Of course, liking a product isn't enough on its own; investors should research a retail stock as they would any other investment. But there are a few guidelines that are particular to retail that can help investors make better decisions in the sector. While there is truth to that notion, the problem with focusing on it too much is that it changes quickly from one quarter to the next or from year to year, and factors outside of the company's control like weather and competitor actions can affect it. A company that consistently puts up strong comparable sales growth is worthy of recognition, but often those streaks come to an abrupt end. Lululemon athletica (NASDAQ:LULU), for example, was putting up huge comparable sales growth once upon a time. In 2010, same-store sales grew a whopping 30%, a growth rate virtually unheard of. The brand was new. Awareness was growing fast, and the company offered a product -- high-end yoga apparel -- that essentially didn't exist before. The surrounding buzz helped drive skyrocketing sales, but it didn't last. Fast forward a few years later to 2013 and increasing competition and the company's own miscues, including a pant recall, meant comparable sales increased just 4%. Chipotle Mexican Grill is currently in the midst of a comparable sales plunge due to last year's food safety problems, but before that incident occurred management noted that comps tended to track in three-year sales, spiking in 2011 and then in 2014. But the best time to buy the stock would not have been when comps were up, but rather when comps were cycling down in 2012 and bearish attention caused the stock to drop nearly 50% to $240. Once same-store sales accelerated again, the stock more than tripled from that price. Often, buying an otherwise strong retail stock when comps are down can be the best strategy as shares tend to surge once comps rebound. Not all retail sectors are equal. Some have performed much better than others in recent years. While electronics sales have struggled, sales at home-improvement stores like Home Depot (NYSE:HD) and Lowe's (NYSE:LOW) have boomed. As the chart below shows, both stocks have crushed the S&P 500. The Census Bureau provides a handy report on retail sales by sector. So far this year, building material stores have increased sales by 6.4%, ahead of the overall retail average at 2.6%, a bullish sign for Home Depot and Lowe's. Other categories that have outperformed include restaurants and bars and health and personal care stores. 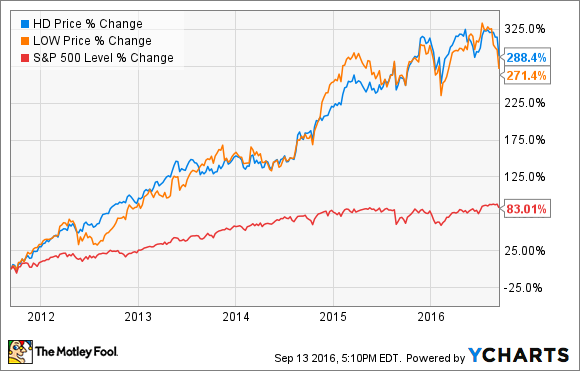 Given that, it's no surprise that CVS (NYSE:CVS) and Walgreen Boots Alliance have also outperformed the market over the last five years. In restaurants, Starbucks has been a particular standout. Unlike same-store sales, retail sector trends tend to be more consistent. Home-improvement stores have gotten a tailwind from a bullish housing market and low mortgage rates, a trend that's lasted several years. Drugstore chains have benefited from Obamacare, which has driven increases in prescriptions, bringing in sales and traffic. Another reason why drugstore chains, restaurants, and home-improvement stores have done well is that they are essentially Amazon-proof. The e-commerce giant has toppled brick-and-mortar bookstores and electronics stores, and is now threatening department stores, which have seen sales fall 3.9% so far this year. Sectors that have a protective moat against e-commerce and Amazon have thrived. E-commerce is the biggest force in retail today, and investors should consider the effect that online sales could have on their investments. Costco Wholesale (NASDAQ:COST) , for instance, has been a consistently strong stock, but recently comparable sales have slowed and the company could see an increasing challenge from Amazon, especially with Prime, a competing membership service. Costco management has resisted improvements in e-commerce, like allowing customers to shop online and pick up in-store, preferring to drive traffic through the store, but Amazon's rise may give it no choice but to boost its online appeal. But traditional retailers can benefit from e-commerce also. Wal-Mart's online grocery pick-up program has proven to be a hit, and has expanded to nearly 400 stores in more than 60 markets. The success of that service is a key reason why Wal-Mart's e-commerce sales accelerated last quarter for the first time in two years.